It rained last night. That was a very good thing. We were hoping for it. 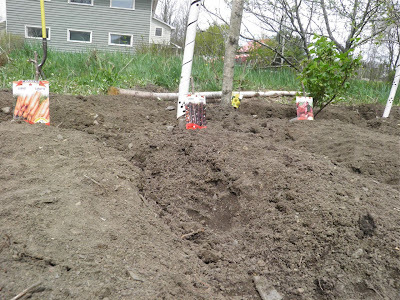 We planted our small garden patch with vegetables yesterday. So the rain certainly came at a good time. 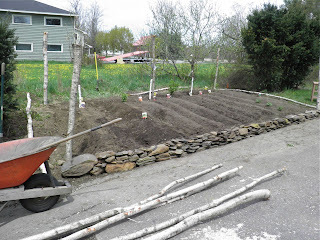 We used birch poles for fencing. This was part of the plan of moving to the country. We wanted to drastically cut costs (we no longer have a $1200+ mortgage, $3700 property taxes, water bill, a large draughty house to heat, etc.) and become somewhat more self reliant with regard to our food stream. I heard my father’s voice in my ear the whole time we were doing it. He would have been proud, I think. He also would have been telling me we were doing some things “wrong.” Or at least not the way he would have. Dad used to plant a garden about 60’ x 80’ every year. It helped feed us and many of the “cabin people” who summer around the lake. His garden had a real social aspect for him. Ours is considerably smaller at about 20’ x 14”. In it we have jammed so much seed... peas, beans, carrots (orange and purple), radishes, cucumbers, Swiss chard, mesclun greens, squash, cucumbers, onions and corn. Oh, and a few tomato sets. I don't think I forgot anything. One of our pair of pears. In the same area we have 2 young pear trees, an apricot, a jostaberry, black currant and gooseberry. They're all small so won't interfere with anything else this year. We have beans and peas in large cast iron urns as well, plus I'm going to be growing fresh herbs in another. Hopefully with more success than in the past. At least they'll have much more sun than when we were city folk. The garden is thick, to say the least. There’s only two of us so if even half the seed grows we’ll have quite a lot on our hands. We may even have to give some away. The main benefit of a small garden is that it’s... small. It’s easy to tend, weed and harvest. I remember groaning the times I had to help weed dad’s garden. I didn’t help nearly as much as I should have. I regret that now that I'm grown up. A drawback of a thickly planted garden is that the soil will become depleted of nutrients far more quickly. So we’ll have to remember to fertilize part way through the season. We also have to get some straw for between the rows to keep down weeds. 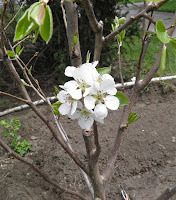 It will stay through the winter and be turned into the soil to help enrich it for next year. I think we did pretty well. The area we used was once covered by a very large Rosa Multiflora. They’re akin to a weed. The thing had grown to monstrous size. Interestingly, when my spouse cut it out the ground underneath was completely bare. No sod to remove. The black currant will fruit this year. It came from Spencer's in Shelburne. No wonder the rose was so big. The soil seemed to be some of the best in the whole yard. Nice and chocolately brown, crumbly with a lot of organic matter. 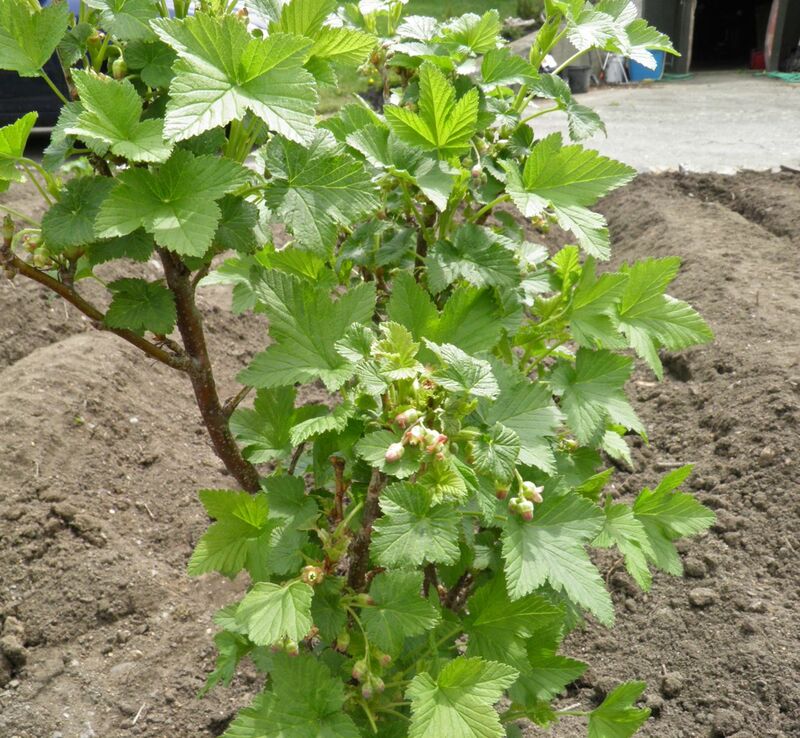 The soil seemed “friable.” That means that it has a crumbly texture that can hold moisture and allow deep root growth. The sun is on the plot almost the whole day as well. We prepared the bed with shovels – no tiller. We went down about 10” deep so everything should have a nice loose soil for optimal growth. We also added organic matter and manure. We did have to remove the extremely large and crawling roots leftover from the previous plot occupant, the rose. That took some doing. We worked from 9:30am to about 2pm. 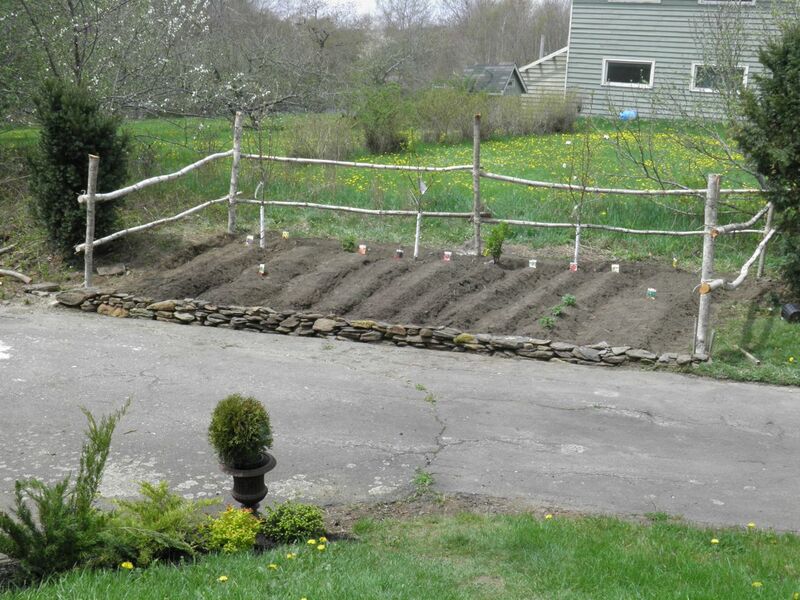 That took us from unturned soil to neatly planted rows. It also included putting up birch stakes as a bit of deer deterrent. Time will tell if we can actually taste the fruits of our labour, but I do have to admit I had fun. I’m a bit sore today, not being used to much in the way of outdoor labour. That will be a benefit of gardening too. Out of necessity we will have to be outside in the sun. There is more to come. I want Roma tomatoes and we have one row that has nothing in it yet. Who knows what will go there. Come late summer I’ll be canning and preserving for days – hopefully. The garden looks good. There was a real sense of pride when we were done. That was an unexpected benefit. Tending it as it grows should be equally as rewarding – hopefully kind of a vegetable soup for the soul. Carrots, purple and orange, and beets.